With an abundance of isolated coastlines and breathtakingly beautiful landscapes, it’s no coincidence that the unspoilt Shoalhaven on the NSW South Coast is one of Australia’s most-loved family travel destinations. The beaches, hideaways and adventures on offer are all contributing factors that have rightfully put the Shoalhaven on the national – and international – holiday surfing map, perfect for the next family holiday. Australian professional surfer Tyler Wright learnt to surf with her family at the unspoilt beaches dotted along the Shoalhaven coastline. 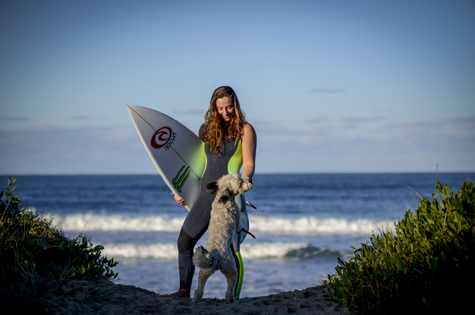 As a passionate surfer and advocate for the adventures on offer in her home region, she is now launching Shoalhaven Tourism’s “Surfing Shoalhaven” guide, collating the best beaches and waves, road trips and activities on offer in the region. We all love the fond memories of holidays on the beach in the summer, and the Shoalhaven is the ideal place to relive those special times. Whether it’s a couple’s weekend away, or a beachy family holiday, the Shoalhaven is just two hours from Sydney and Canberra and boasts unspoilt beaches and delicious eateries to satisfy all tastes – even the kids! If you’re tempted to dip your toe in the water, there are loads of friendly surf schools and stand-up paddle board hires to help you, including one of our first female surfing World Champ’s, Pam Burridge at Mollymook. You can also enjoy a sight-seeing bike ride around Jervis Bay or a tree top adventure where you navigate your way through obstacles and flying foxes over 100m long. The “Surfing Shoalhaven” guide is available to download from http://www.shoalhaven.com.au/surf, or copies can be found at the Nowra and Ulladulla visitor’s centres, detailing the best surf breaks, conditions and maps, local suppliers and stories of the champions. It also has road trip recommendations, a variety of accommodation, tips from locals, plus the best spots to rest and refuel. The Shoalhaven is the ideal location to surf the day away while being surrounded by playful dolphins, untouched national park and breathtakingly beautiful landscapes. If you’re up for adventure and exploration, you’re bound to be rewarded!